This Bernina 770 is my first Bernina! Isn’t she beautiful?! She’s less than three months old. A year ago, I began researching sewing machines. 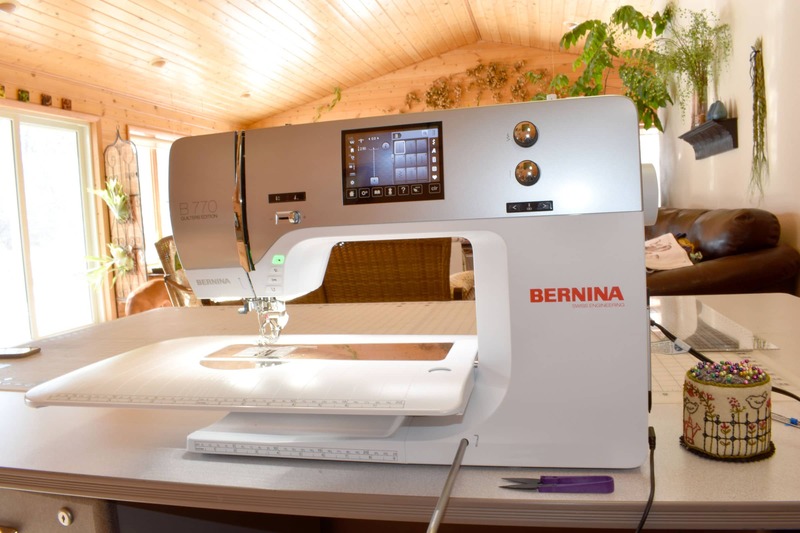 I settled on a brand and model (not Bernina) and I purchased it from a local dealer. That machine (not my Bernina) skipped stitches on anything slightly thick. It’s not like I was sewing saddles or something crazy that you wouldn’t normally do on a home machine, just normal things like totes, hemming jeans, polar fleece hats, etc. Several times it couldn’t go over the seams at all and I had to handstitch areas. I decided to cut my losses and find a more robust machine (it was either that or quit sewing all together. It was just too frustrating to continue with that other machine). 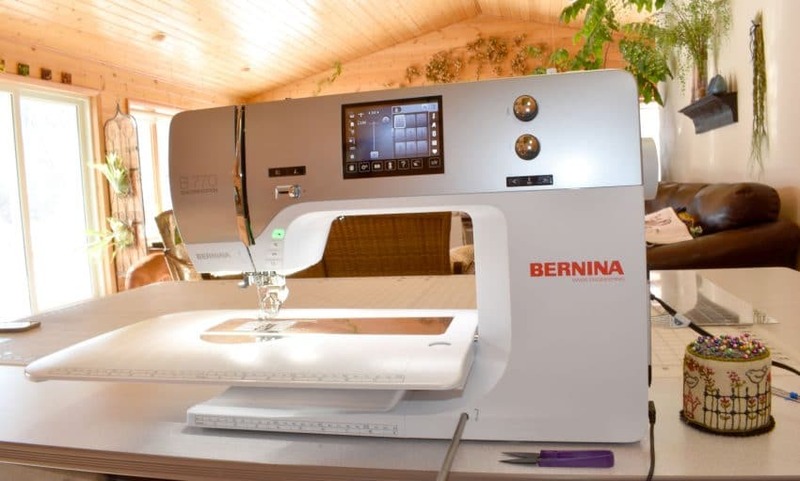 I researched more and settled on the Bernina 770. She is a powerful machine with beautiful stitches and amazing feet and attachments. She lives up to my hopes and expectations. The free classes at my local Bernina shop were amazing. I learned a few tricks that I would not have come across on my own. I am now a Bernina girl for life! Wow, good for you! Love your sewing environment…. looks like lot’s of light. Yes, this room is amazing! My husband and I built it ourselves about 15 years ago. We use it a lot. It is open to the rest of the house so I do have to maintain a little bit of a neater sewing space but it’s a nice comfortable space for sewing. Sure wish you would reveal the “not Bernina” machine brand so I won’t make the same mistake! Actually, I think I already made the same mistake a few years ago because I was not well-informed when it came to sewing machine brands. I’m again looking for a new machine and read all reviews I can find on line but still confused. Bewood, the “not Bernina” machine was a Baby Lock Soprano ($1500). I had taken that machine back to the dealer for them to adjust but it was the same. They told me I should use 90/14 needles because the scarf is longer or shorter or something and to use new needles. It didn’t make one bit of difference. My other problem with it was that it pushed thin fabric into the feed dogs. At the beginning of every seam of thin fabrics, I would place a piece of tissue paper under the fabric to keep it from being pushed down. The Bernina has an even larger opening on the needle plate and it doesn’t do that, even on thin knits. It’s not fair to compare a $1500 machine to a $6K machine; I do realize that, but I hope no one else makes the mistake I did. That was an expensive mistake. Thank you so much. I currently have a Viking, but am not happy with the service I receive from the local dealer. I was actually thinking about the BabyLock Crescendo! You may have saved me from another bad experience. I’ve read so many reviews on line that I’m almost too confused now to care if I even get a new machine. I read reviews and stats on many machines too. It is completely confusing I agree. It’s a lot of money and you don’t want to make a mistake. I relied on this review by repairmen quite a bit: https://www.sewingmachineshop.com/dans-and-martys-top-picks.htm And then I took my own difficult fabrics to my local Bernina shop. I had told my sales person that my main problem was the skipped stitches when things got slightly thick. She rolled together the stiffest, thickest denim I’ve ever seen. She rolled it until it was over a 1/2″ thick and ran it through the machine. Every single stitch was perfect. I was sold right there.I also tried my thin slippery knits and saw that they were handled nicely too. The BL Crescendo is a big step up from Soprano, so maybe it’s much better. I would recommend taking your own fabric and trying out several models. Best of luck to you! Thanks so much for this link. Wish these guys were near me as I’d buy from them in a heartbeat.